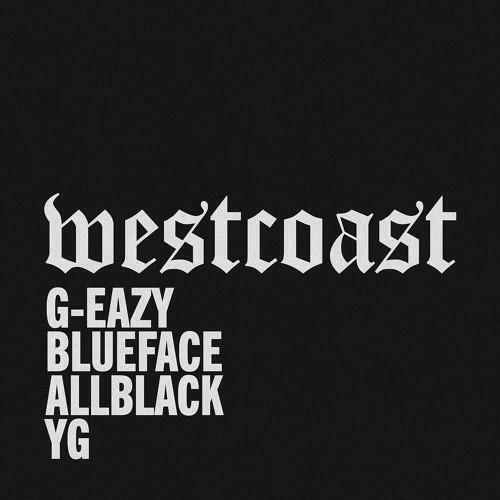 Home>New Songs>G-Eazy Songs> G-Eazy Adds YG & ALLBLACK To Blueface-Assisted "West Coast Remix"
The West Coast's "old guard" (meant not with disrespect but rather an acknowledgment of stature) has changed. Iconic artists like Ice Cube, Snoop Dogg, DJ Quik, Dr. Dre, and Xzibit have slowed in their output, evolving with dignity into "legacy act" status. Now, the new faces of the West Coast have been left to carry the torch, with G-Eazy, YG, and ALLBLACK doing their due diligence in that regard. Now, the trio have come through with a remix of Young Gerald's "West Coast," which originally featured the unique skillset of Blueface Bleedem, a divisive newcomer to the rap game. Unfortunately, G-Eazy opts to keep his original verse intact, rather than adding a fresh take on the revised version. Likewise for Blueface, which makes the first half of this remix near-identical with the original. The differences commence when ALLBLACK slides through for a third verse, skewing notably closer to the Blue One on the flow spectrum. "I be with rich white boys you could've sworn was bums," he raps, a boast for the ages. YG comes through to close this one out, bringing no shortage of charisma to the 808-driven instrumental. Check this one out, as it's among the closest we've come to a true-born West Coast posse cut in a minute. What do you think of this updated remix? SONGS G-Eazy Adds YG & ALLBLACK To Blueface-Assisted "West Coast Remix"